As steel horse barns increasingly becoming popular, wooden counterparts may soon become a thing of the past. Horse owners have for several years relied on wooden pole barns to house their highly esteemed animals. They are for the longest time serve as a legacy. But with the emergence of other more sturdy and cost-effective alternative construction materials such as steel, this type of structure are quickly becoming outdated. More horse owners are now opting for a more innovative method of construction such as prefabrication. For some owners, a horse isn’t just an animal but a member of the family. Hence, some are really investing considerable time, effort and money into making sure their prized animal gets a comfortable living space. Steel horse barns are making a radical change in this market, offering a more modern option. Steel horse barns are more flexible in design. Building a horse shelter may require a lot of work on your part, hence it is also necessary that the process will be as efficient and comfortable for you as it is for your valuable animal. 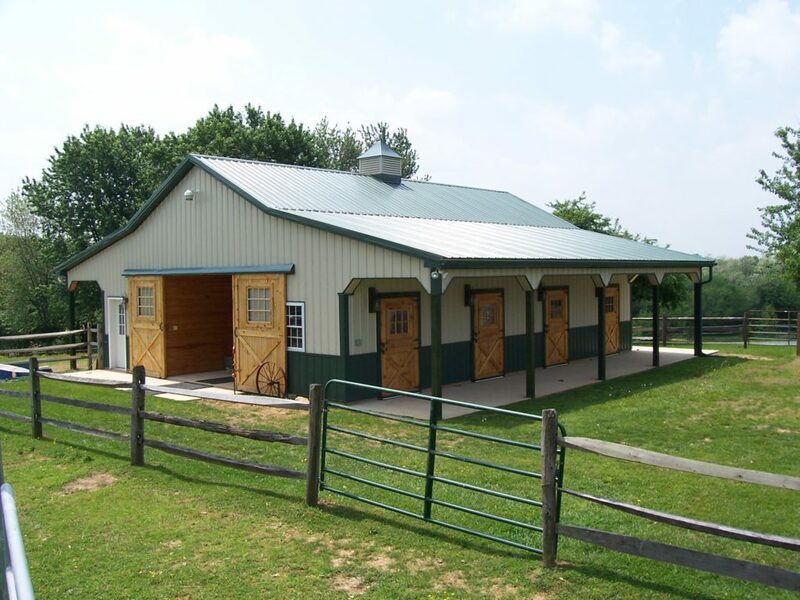 Steel horse barns can give more owners the design flexibility that their wooden counterparts cannot. They can be customized to make the building process as smooth as possible, from planning to erection. They can be designed to fit the specific needs of each client. Moreover, whatever feature you may want to add, you can modify the structures easily, thanks to the clear span space they offer. The interior of the steel horse barns usually has no columns which consequently result in an open-wide space that gives owners sufficient room for maneuvering, uninterrupted working space, and easy alteration. Wooden pole barns, on the other hand, are not built with future expansion in mind. Many of them are limited to up to 90 feet width while steel buildings can be stretched to as 300 feet without requiring support from interior columns. One of the key advantages of building your pole barns with steel is the fact that it is easy to assemble. This feature was most celebrated during the 1930s but is still being promoted in today’s generation. Most of the building process such as welding, drilling and punching are already done in the factory before the structure is delivered at the job site. Upon arrival, you can quickly set it up which means you would not have to worry about construction delay. The cost can be half of what is paid for a conventionally built horse barn. Moreover, while wooden structures can be more appealing budget-wise due to lower cost upfront, the total cost of ownership may quickly balloon as soon as maintenance and repair are factored in. With steel building, you no longer have to worry about familiar pests such as possums, raccoons, rats and mice. They all cause significant damage not only to your structure but also to your horses and their feeds. A steel horse barn can effectively drive out these daily hassles. The explicit and steady built of steel buildings avoid any presence of a hole, crack, breach or slot where rodents may enter. Even a more aggressive animal such as a raccoon cannot penetrate through steel as much as they do with a wooden building. It is vital to keep your pole barn free of pest infestation to maintain a clean and safe environment for you and your valued animals. As an added protection, you may also consider investing in a fly control system, especially during the equine fly season. This usually takes place during April to September where horse flies pose threat to any livestock due to some harmful bacteria they can pass into feeds. Steel is amongst the most reliable construction materials for structures whether small or big due to its durability. Depending on your supplier, steel can be composed of premium components which can brave the impact of the most severe weather conditions. Contrary to wooden counterparts, steel horse barns are non-combustible. A majority of the wooden pole barns cannot be even trusted to last long. A steel building meanwhile is intended to last for decades and it usually comes with a warranty of up to 50 years. They are known for their inherent strength and consistency. Moreover, steel buildings only require zero to low maintenance. In contrast, a conventional pole barn can be costly and time-consuming to maintain. Steel will not expand or crack, and will not warp or rot. A conventional construction method would require wooden poles measuring around 4 to 12 inches in diameter to serve as the skeleton of the building. They support the roof and maintain the stability of the structure. The poles are usually 96 inches apart and are often set in shallow holes and unsteady ground. Steel buildings, on the other hand, have columns that are anchored to concrete piers or pad. Pole barns placed into shallow holes can be potentially dangerous as soil conditions can change abruptly. The wooden poles can move as the ground shifts and thereby compromising the structural integrity of your structure. They are highly combustible. According to a study conducted by the University of Kentucky College of Agriculture, there are over 200 horses dying every year due to barn fires. Due to the potential fire risk that comes with buildings made of woods, the insurance cost for them is also higher. Wooden pole barns are susceptible to decay as they lack the precision of steel structures. Holes and gaps can result in leaks which kick off the decay process. Pest infestation. Rodents and termites can easily gnaw through wooden pole barns which could lead to structural deficiencies. Metal Prefab Buildings is now on Twitter. Follow us @metalprefab for more industry news and experts insights!